No fewer than eight young Bundesliga stars have been named on UEFA.com's list of 50 players to watch out for in 2018. 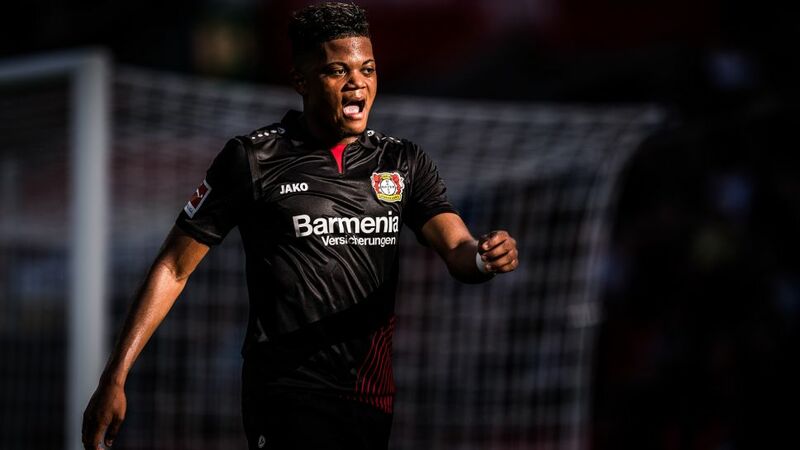 Bayer Leverkusen winger Leon Bailey, Schalke starlet Amine Harit, RB Leipzig stalwart Dayot Upamecano and Borussia Dortmund's England youth international Jadon Sancho have all been included in the list compiled by UEFA.com correspondents. The quartet are joined by Jann-Fiete Arp (Hamburg), Benjamin Pavard (Stuttgart), Felix Uduokhai (Wolfsburg) and Luka Jovic (Eintracht Frankfurt). Jamaica international Bailey, 20, has blossomed into one of the Bundesliga's most exciting talents this season. The former Genk star's six goals and four assists have helped lift Die Werkself to fourth in the table at the halfway point of the campaign, his mazy runs, blistering pace and exceptional vision tormenting opposition defences on a weekly basis. "He's incredibly quick, with and without the ball," said Leverkusen head coach Heiko Herrlich. "He reads the game really well, particularly in attack, and thrives in a 3-4-3 formation. He's also incredibly disciplined." Harit wrote his name into Schalke folklore during the astonishing 4-4 draw with bitter rivals Borussia Dortmund in November, capping an all-action display with the Royal Blues’ second goal at the SIGNAL IDUNA PARK. The Bundesliga’s most dangerous dribbler (he has won 58 of his attempted dribbles so far this term), the 20-year-old Moroccan has also clocked up three assists. "He's a real livewire," explained Schalke tactician Domenico Tedesco. "He's quick, skillful and very difficult to get off the ball. He'll only get better, too." Signed from Red Bull Salzburg in January 2017, 19-year-old centre-back Upamecano has played the full 90 minutes in 11 of Leipzig’s 17 league matches this season, his no-nonsense yet measured approach to defending earning him plaudits from fans and pundits alike. "Upa is the future," Leipzig coach Ralph Hasenhüttl told Germany's leading sports specialist magazine kicker. "He's a great lad. We've got a real gem in our ranks." Dortmund starlet Sancho has yet to start a competitive game for the club but has shown glimpses of his enormous potential, coming off the bench in games against Frankfurt (Matchday 9) and Bayern Munich (Matchday 11). The 17-year-old former Manchester City prodigy was recently handed his start for the club in the Yellow-Blacks’ 2-0 friendly win over Fortuna Düsseldorf. "He's a massive talent, one of the best players in England in his age group" enthused Dortmund sporting director Michael Zorc. "I'm in no doubt he'll give us a lot of pleasure in the coming years." The first Millennial to appear in the Bundesliga, HSV striker Arp entered the record books as the Red Shorts’ youngest ever goalscorer against Hertha Berlin on Matchday 10. The Germany Under-17 international only recently turned 18, but he already looks a cut above the majority of his peers across Europe. "Hamburg and Germany have got a real player on their hands in Arp," gushed Stuttgart and Germany veteran Mario Gomez. "Even at 19, I wasn't as dominant and rounded as he is now. He's already an incredible talent." Watch: Arp describes "most awesome moment of my career"
Pavard’s rock-solid displays at the heart of Stuttgart’s defence earned him a maiden call up to the senior France squad in November. The 21-year-old, who has played every minute of the Swabians' league campaign so far, was handed his international debut in Les Bleus’ friendly win against Wales, before coming off the bench in a 2-2 draw with Germany four days later. "The way he's developed is just fantastic," commented Stuttgart coach Hannes Wolf late last year. "He hadn't played much first-team football when he came here, but he's thrown himself into it and his approach and execution have been spot on. We're delighted." Uduokhai has made a relatively seamless transition to the Bundesliga, after swapping Bundesliga 2 side 1860 Munich for 2008/09 Bundesliga champions Wolfsburg last summer. The 20-year-old has made 12 league starts so far this term and only missed out on three occasions - all through injury. He's also come up with some big goals, including the equaliser against Hoffenheim on Matchday 9 and in each of the two previous rounds of the DFB Cup. "I went to watch Felix when I was still in charge of Mainz," revealed head coach Martin Schmidt after Uduokhai helped Wolfsburg past Nuremberg in the third round of the DFB Cup. "He was on our wish list. You can see the qualities he possesses, and what we're missing when he's not on the pitch." Jovic has been doing his chances of earning a permanent deal at Frankfurt no harm at all of late. The Serbia striker, who joined the club on a two-year loan deal from Benfica in the summer, was in and out of the side earlier in the campaign, but started Eintracht's last two outings prior to the winter break, scoring his second Bundesliga goal in the 2-2 draw with Schalke on Matchday 17. Sebastien Haller, watch your back! "He's got so much quality," said Frankfurt teammate Danny Blum following Jovic's debut goal in defeat to Augsburg on Matchday 4. "It's really impressive what he can do in the air and with his feet. He's got a huge career ahead of him."